Many of the villages we have reached so far have expressed the need for solar powered lights. 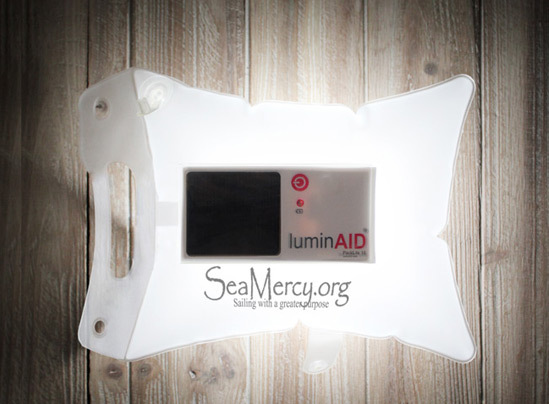 Sea Mercy already has the "Give Light - Get Light" program in place that makes it easy to donate this amazing product by luminAid! It is any easy way to help and if you want to maximize your donation, there is an option to donate both lights. Check out the program and see this amazingly versatile light. The link below will take you to the Sea Mercy website where you can "Give Light - Get Light". Bob McDavitt's ideas for sailing around the South Pacific. Disclaimer: Weather is a mix of pattern and chaos; these ideas are from the patterned world. 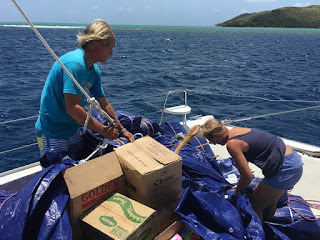 I repeat that I am willing to help ANY yacht with FREE weather information if they agree to fill up with medical supplies on their way to FIJI/TONGA as part of SEA MERCY to supply relief after this cyclone season. This way I sponsor humanity. Every time I open Facebook my heart swells with pride and love for the amazing things that people are doing to help other Fijians out. Vinaka everyone for acting and living the love. Makogai Island – Lomaviti Group: All the villagers are healthy, safe, well and morale is good given the loss and damage they sustained. Water is still their biggest challenge. Sea Mercy has delivered additional hand held water storage containers and has them in building catchment in the hope it will rain soon. Vessels are making water for the village. Batiki Island – Lomaviti Group: NDMO tasked Batiki to Sea Mercy because of the narrow channel access which makes it impossible for large vessels to service it. The Sea Mercy fleet will do a dawn departure from Makogai 23 nm away in hope that the conditions will allow them to drop off of well needed supplies. While our First Response Fleet is working hard to get desperately needed food and water to the remote islands in Northen Lau, the second phase of Sea Mercy's response, the Recovery Fleet, will begin operations at the end of cyclone season. 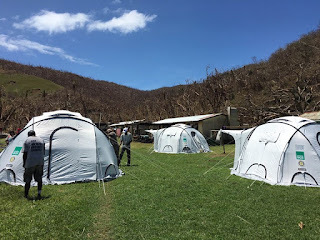 Our experiences in Vanuatu last year after Cyclone PAM proved to us that small teams of cruising boats, working together, can make a significant contribution to the recovery of devastated remote islands. The muster port for New Zealand will be Opua (Bay of Islands). Briefings are planned to commence there on 25 April, with a view to departing at the first suitable weather window thereafter. 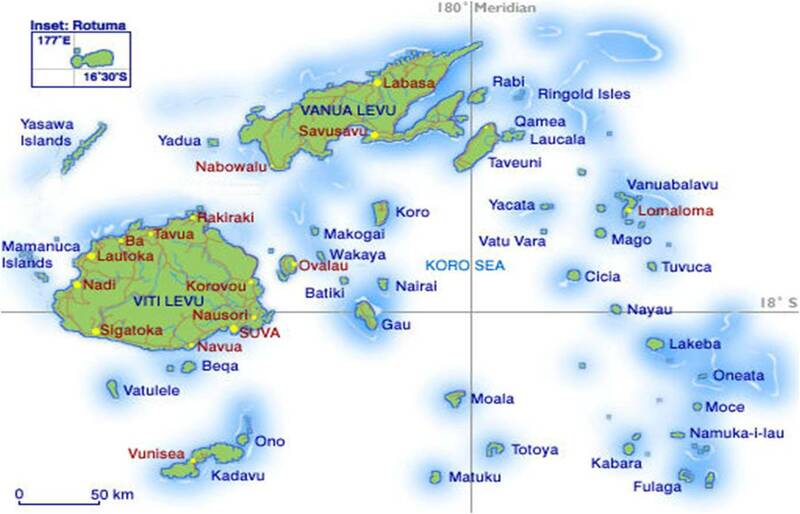 We have several vessels north and east of Fiji in Tonga and The Marshall islands as well as some in Savusavu, Fiji. A second rally point and tasking will be determined for that group. First pics out of Makogai. The lack of vegetation will be a huge problem - yeah for the Shelter Boxes! Just need to sort out a water solution and get some seeds so they can start their gardens growing again. Urgent Need For Local Donations of Mats!! Suva - Monday, place to be determined. Pacific Harbour - Monday and Tuesday at Nai'a Diving offices office in Pacific Harbour. They are located in Art's Village closest corner to Rajeev's Service station. The sign says "Nai'a Cruises and Pacific Islands Travel". The office will be open Monday from 8 - 5 and, on Tuesday, the mats would need to be dropped off before 10 am. Lautoka - Monday and Tuesday at the Lautoka Main Wharf gate. Just say that it is for TC Winston relief supplies for Nai'a. Ideally, this could happen all day Saturday, Monday and Tuesday. Please pass this message along to as many people as you can. I will update the post with a location in Suva soon. Today Sea Mercy again changed lives! In conjunction with Rotary, the Red Cross, and representatives from the DO Lautoka, Sea Mercy were the first outside support to reach Tikina Bureiwai in the Ra District. They have 150 people in a cluster of 4-5 villages, including a primary and a pre-school. Nearby is the Tikina Kavula and the Namarai Station that shelters 2 additional villages which were also supplied. 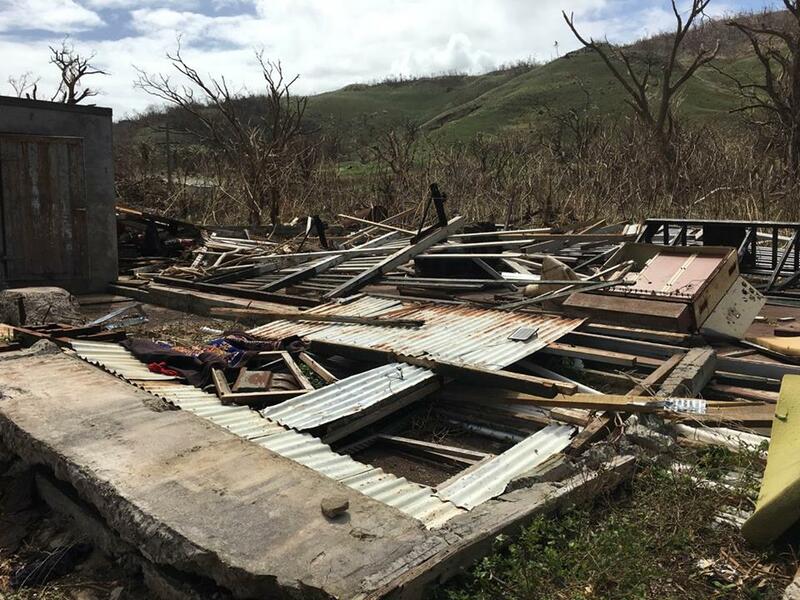 Bureiwai not only had a direct hit by Winston on Saturday but almost immediately also got hit by a 1 ½ m tidal surge through their village sweeping any of their salvageable belongings out to sea. Sea Mercy has been their only avenue of support and we supplied, food, clothing, medication and basic building supplies. One of our volunteers said “Fijian’s are very resilient, but these people, children and babies were in desperate need of help and so grateful when we finally arrived today”. Nai'a is a live-aboard dive boat that operates in Fiji (www.naia.com.fj) who has volunteered to be part of our fleet and has been out checking on some of the islands. As Susan mentioned in her last report, they spent the day on Makogai and we just got this feel good story from the owner, Alexxis Edwards. "The passengers (18) and my crew were all on their way back to the ship after 6.5 hours at Makogai. The passengers did not want to leave until they built a shelter for the children after one of the guest found out that the kids have been sleeping outside on the ground. They took apart one of the downed walls of the school and built a foundation and used nets and scraps to somehow built a roof. The kids now have a sheltered place to sleep. So far so good…. those Shelter Box’s will be wonderful!" Thank you Alexx for all your crew and passengers' hard work and concern!! You are making a difference! The villagers of Makogai are so grateful to have the live aboard dive vessel “The Nai’a” as part of our Sea Mercy fleet. The Nai’a has been the first outside help to reach the island. The Nai’a arrived midday today to find pretty much all the houses were destroyed and 37 adults and 37 children (10 of which are babies) have been with limited shelter, water and food since Saturday night. I can only imagine the relief that they must have felt when those people realized that help was actually coming for them and they had not been forgotten. All the village’s concrete water tanks were cracked and broken so water has been in desperate demand. Today the Nai’a crew found an unbroken plastic water tank that Winston had relocated to some bushes, and all the Nai’a guests, (yes they have guests on board who are pitching in!) crew and all the villagers became a bucket brigade to fill this tank from water transported off the Nai’a by skiffs. We are only in satellite phone communication so photos will follow once first boat returns. Hopefully our other vessel “Skabanger” will arrive midday tomorrow. We also have “Outsider” ready to depart early morning with more supplies to where needed. Concurrently, Sea Mercy is also teaming with Rotary and Red Cross to service two remote villages in the Ra District tomorrow. Again these villages have had no outside assistance since Saturday night and are only accessible by boat. Sea Mercy are also wanting to supply a vessel to the Lau Group and Tavenui early next week, so we are still seeking further donations in kind or cash. Vinaka vaka levu once again for all those who have not only supported Sea Mercy but all the other worthy causes making a difference and helping rebuild our beautiful country. 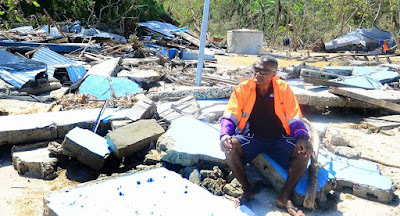 Nigel Skeggs, President of Sea Mercy Fiji, has an office set up in the National Disaster Management Centre with direct access to the Aid coordination team and the Commissioner Western. All government departments are located under this one roof and Commissioner Eastern has given his full support to Sea Mercy. Yacht Skabenger departed Denarau for Makogai island Wednesday 24 Feb at 14:00. Fully loaded with food, hardware and meds. ETA Makogai 48hrs. Most of the directly impacted islands experienced a major tidal storm surge after the cyclone passed. Which means that all debris, pots and pans, clothing, food, etc were all washed out to sea and they have been left with nothing. In the provisioning of the first 2 boats we have completely emptied our donated goods. Vinaka vaka levu for those who have donated goods, time and money so far, we really believe that this Sea Mercy mission will make a world of difference to those living in remote islands.